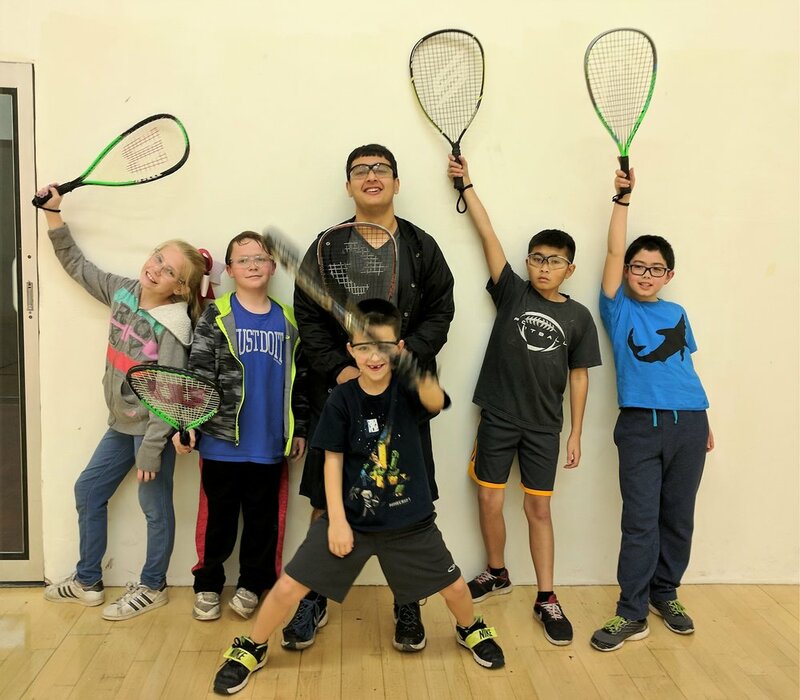 Over the past 20 years, the city of Stockton has had a very successful run of producing Junior National and World Racquetball Champions. This is in large part due to the players emerging from In-Shape West Lane, many of which began playing when they were six and now compete professionally. The one constant in this picture is Coach Josephine (Jody) Nance. Jody has led the West Lane Junior Program since the 1990s, often on her own, and to this day continues to introduce and develop new young talent for the sport. Jody gives some instruction on swing technique to some young players. Jody began her athletic pursuit at a young age as a track and field and cross-country athlete. Known for her “barefoot” running style, she excelled in the AAU programs in the Central Coast of California, which eventually landed her a scholarship at Boise State University. While at Boise, Jody would spend some “down time” in the summer playing tennis with friends, which ultimately transitioned into racquetball, a relatively new sport at the time. Some of the Boise State football players challenged Jody to a game, which she gladly accepted, and even though it was a little wild and crazy on the court with three offensive linemen, she fell in love with the sport. When her athletic eligibility ran out, she joined the local YMCA, began playing racquetball regularly, and never stopped! Naturally, the ﬁrst few years of this new program did not bring about National Champion players; it took time. Participants were, for the most part, children of a few of West Lane’s handball families. The Rojas, Diaz, and Aldana Families all had boys that ranged from 3-11 years of age. During this time, Jody’s initial goals were to develop her players’ total games, including mechanics, drilling, shot selection strategies, and cardio training. Thanks to past successes of John Ellis at the Junior Championships, Jody was acquainted with the National and World tournaments. Although perhaps lofty goals at the time, she set competing in these events as goals for the group. Needless to say, the payoff has been great. The feeling is mutual, as the Rojas, Diaz, and Aldana Families all credit Jody for helping raise these ﬁne young men. Jody’s work continues, and is evidenced by a new group of talented players appearing on the World and professional stage including, but not limited to, Daniel, Jesse, Antonio and David Rojas, Ricky Diaz, and new families of Stockton Junior Racquetball with the Galvan’s, Rivera’s, Canchola’s, Ellis’s, and LaRue’s. Jody’s life in racquetball is not limited to her coaching. She has and continues to be highly competitive. She has enjoyed great partnerships with Elaine Dexter, Marko Perez, Ninja Nomura, and last but not least, Josie Rojas himself. She has captured multiple National Doubles titles in Mixed and Women’s Divisions, and she has had too many local Northern California wins to count! Her frontcourt skills and ability to anticipate opponents are some of the best tactics ever seen on court. Jody is a one-of-a-kind person with the kindest heart of anyone you can ﬁnd. Her passion is to help others enjoy whatever they are doing. She has empowered so many young athletes in her 20+ years of coaching racquetball, and you can believe she will be around for years and years to come. We are lucky to have such an outstanding person involved in our Fitness Forever Program. Go Jody!